Using drawing, printmaking, paper cutting and sculpture, I transform everyday objects by pushing them into a liminal state between the identifiable and the symbolic. 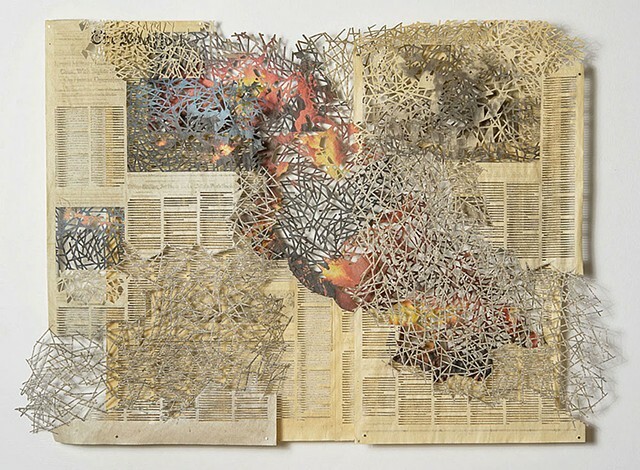 By intricately cutting and reconfiguring newspaper pages, I gesture toward censorship, subjectivity, and the energy between and beyond words. By remaking items of cultural production and consumption by hand, I strip them of branding, shift their context and tease out the aesthetic elements of value and desire. In all of my work, the formal conventions of mass media and consumer society collide with the more metaphysical aspects of knowing and believing: hands-on craft, repetition, beauty and ritual.I transform appropriated print media through paper cutting, collage, sculpture and printmaking.